As a pretty passionate baker on a somewhat limited budget, I often find it hard to source some of the more exotic components baking can call for. I only have a local Sainsbury’s and an Aldi to buy from- sometimes I struggle to find brown sugar there, never mind if I need some gum tragacanth to play with! Of course you could source these ingredients online, but I always seem to have to search around for a place within my price range. And how else will I be able to provide a comprehensive review without giving these items a good workout? Say, making some adorable upside-down bunny cupcakes! And just in time for Easter too! The Cake Decorating Store sent me their tutorial for these cupcakes for me to follow but they have yet to post them on their website. I will provide a link here once they do. The items reviewed are listed below. Click on their names to jump to that product’s review. Sugarpaste/rolled fondant can be used to cover cakes, cookies and for modelling. While you can make your own, buying ready made packets is so convenient, especially if your creation involves several colours. I used the sugarpaste to model the bunnies. The Cake Decorating Store provide many different sized pack of sugar icing, so you can just buy as much as you need. Smaller packs are great if you just need some for modelling (like I did). Plus, it allows you to blend icing together and create your own colours! The sugarpaste was easy to knead and not too dry (which some ready made icing tends to be). The colour was consistent throughout and most importantly, it was tasty. It’s everything you need it to be- thumbs up. Sugarcel is a gum tragacanth substitute and is used for stiffening fondant for modelling. Once kneaded into the sugarpaste, the icing was still workable modelling my bunnies was very manageable. I left my bunnies to dry overnight and they hold their forms very well, without the icing being too dry. large and small bone tool. Every baker should own a modelling set like this but I am not sure if these would be the ones I would recommend. For the price, they are great. However, I found the tools a bit too thick and clunky to work with (though that may just be my tiny hands hindering me). One great feature of this kit is the fact the tools aren’t all one piece of plastic. The tip of each comes out, which is great when washing them. I am very concious of the bacteria which harbour in the crevices of my baking supplies. The glitter was so shiny and made perfect embellishments for the bunnies’ tails. The Cake Decorating Store do so many more colours than the standard primary colours and of different sizes. Edible glue, of course, is used to stick the various pieces of your fondant model together. I must admit, I have never used store-bought sugar glue (though that is probably because I can never find it!) so I was blown away with how convenient it is to use! The pot comes with a little brush in the lid to apply the glue, which is just fantastic. The glue itself was fast to set (while not becoming gloopy), which was great as I didn’t have hold my pieces together waiting for it to dry. Although it wasn’t so great when I spilt some on my hand. Doh! I am always a bit wary of buying cheap cupcake cases as the grease can seep through them, ruining the aesthetics of your beautiful cupcakes! Or they can be too flimsy to hold your batter and deform, causing some really oddly shapes cakes. As I’m a paranoid person, I often just double up to ensure neither of these things happen. But too my pleasant surprise, there was no need. The cupcake cases are thick enough to retain their shape and their colour looked just as beautiful coming out of the oven as they did coming in. These are very high quality indeed. Available to buy in a variety of colours here. I always find it hard to source the piping tube I want if I’m looking for a specific shape or size. Plus, often piping tubes comes in sets, which can be irritating. The Cake Decorating Store sells piping tubes individually, which I find so helpful. The tube I used for the grass is apparently rust-proof (time will tell) and fitted perfectly in the icing bag coupler I was provided with. The coupler consists of the base, which is inserted into the piping bag, and a ring, which screws the piping tip to the bag. This means you can use the same tip for several icing bags (maybe you are working with several colours) by simply unscrewing and reattaching the nozzle 🙂 Even more conveniently for me, the ring attached directly to my decorating icing tube- no need for the bag! Icing Bag coupler available here. The ready-to-use icing tube is a truly wonderful invention. Not only did I have to make my own icing (the taste was up to my standards), I didn’t even have to bother with a piping bag- the piping tip could be screwed directly on. Plus, the tube’s lid means you can save the icing for later if you so wish. One thing to note is, the tube was only just enough to cover my 12 cupcakes and not liberally. I am use to making up large batched of butter icing so it was odd for me. However, if you just need to add decoration your bake, I think think they are great! Available in 7 colours here. Delivery itself was very quick; it only took a couple of days. If you need supplies urgently, they do offer express delivery. My parcel was wrapped securely and all items prone to leaking or perishing were contained in their own food bag, which was a nice touch. 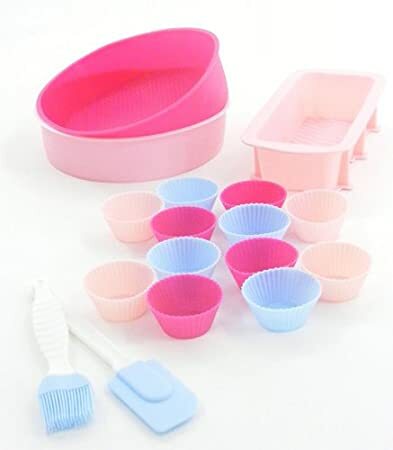 The Cake Decorating Store offers a vast range of products, suitable priced and quickly delivered. And they manage to do all this AND keep the experience personal. I do get the feel I was dealing with real people, rather than a website. 5 out of 5 stars.